A collection of microscopic photos presented on glass slipes. These pictures can only be watched proper through a microscope. Let your body become an art-object and update your new cirriculum vitae with location, time and date. 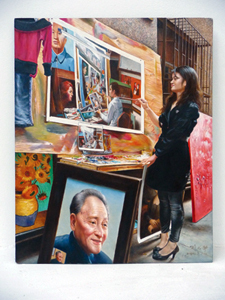 A series of paintings produced in cooperation with several Chinese replica painters reflects a shifting practice of originality and authorship in a portrait producing economy. Small electronic parts have been extracted photographically from their devices and transferred into blueprints for architecture. Three different posters (100x75cm), graphically structured like commercials, pretend to promote innovative TV screens, where the usual function of "watching" is reduced to a colourful by-product.